I won’t argue that “bigger” game experiences are usually found on beefier personal computer hardware, and that consoles have long received simpler, shorter games in comparison. I also won’t argue that I enjoy seeing more complex titles try to break this trend – even today with seeing something like The Witcher 2 pull an exceedingly acceptable port to the Xbox 360. However, not every game can make this transition. They thought they could leave… but their employers wanted them ‘retired’… now, Donna Jaxxon and Pam Grier are out for revenge as… The Black Mambas! Cyber-Cop (called Corporation outside the States) is an advanced first-person dungeon crawler with a sci-fi slant. The plot is mostly bananas. The U.C.C. corporation has been tinkering with genetics in a massive complex outside London. Their prize creation has gotten loose – an enormous green mutant which the game calls “Freddie.” Freddie has been eating the locals, and so the government calls upon you to infiltrate the plant, take Fred down, and bring back evidence of the corporation’s wrongdoing. Your game begins at a character selection screen. 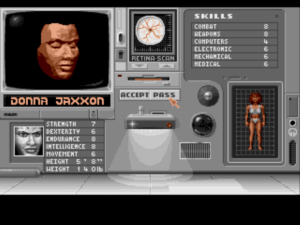 You have the choice between two men, two women, and two cyborgs, with no ability to customize their stats. Each has a balance of RPG stats and skills, though these won’t particularly change how you play the game. You’ll be selecting your agent more on where you want your boost – toward healing yourself, extra damage in melee combat, or a bonus to movement speed. Cyborgs offer up the biggest change, and offer high-end stats and integrated equipment (vision modes and scanners) at the cost of a heavier reliance on parts for repair and power cells to keep operating. The facility has 12 levels, and your primary concern on each is finding computer terminals to upgrade your access card’s clearance. You’ll use the card inside elevators to select the next level. You’ll also encounter code-locked doors in your travels. You can defeat these with electronic lockpicks, or find holographic pictures that can be viewed with a collectable reader. In one early case, the picture was of a hand typing in a door code, and you had to shift the view, Blade Runner style to spy all the numbers through the fingers. Neat stuff. Vision modes highlight alarm lasers, but then it’s not like that emitter is hard to miss. The only customization to speak of is in the initial equipment screen. You’re given a set amount of funds, and best I can tell, can only spend them here. This is where you’ll judge if a more powerful gun is more useful than stronger armor, or trust that you’ll find a lockpick in your travels rather than buy one up front. The largest considerations are to health and energy levels. Humans use disposable med kits to heal injuries, and a canteen to restore energy (instead of parts and batteries for androids). These can be restocked with chemicals and nutrition packets, respectively, which can be found within the level. Almost like The Oregon Trail, you’ll need to balance what you’ll buy up front with how many supplies you think you’ll find in the world, with the risk of premature death if you bet wrong. Energy is a similar balancing act. All your important tech gear runs off a single battery. This battery is used to power your minimap, recharge your gun, or run the vision modes that can detect infrared alarm lasers or dangerous gas clouds. The best (powered) armor also drains energy before health, and cyborg characters have even more need to watch their levels. Power can be recharged with cells either bought at the start or found along the way. It’s up to you to ration your use based on your reserves, and you’ll probably find yourself shutting down your minimap, or conserving your shots, while you desperately search for a new power cell. 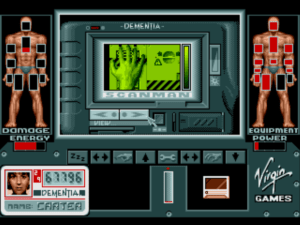 Health is your final consideration, and a paper doll layout on the left of the screen shows damage to different areas of your character’s body. Boxes fill as damage is taken, and detrimental effects kick in once a box is filled about halfway. Take damage to the legs, and you walk slower. Damage to the head causes blindness. Rare medkits can heal this damage, but it doesn’t appear you can direct where they are applied. Critical areas get healed first, but can still you leave you limping if you don’t have more kits to use. Freddie isn’t the only mutant the UCC has been working on. Overall, it’s complicated, engaging stuff, and I’m looking forward to seeing how it all works on the PC. Unfortunately, it’s also bleeding edge tech. Cyber-Cop’s major claim to fame is being one of the earliest free-roaming first person shooters. 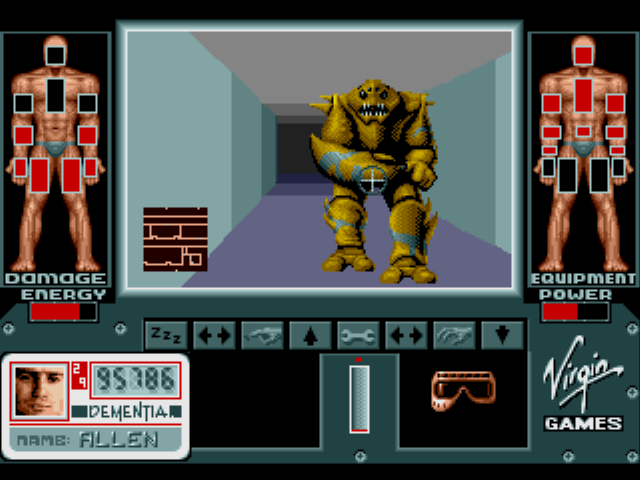 Other games, like Eye of the Beholder or Terminator 2029 used a first person view, but locked your movement to restrictive grids and 90 degree angles. Here, it’s an actual 3D(ish) world created with polys and flat shading, and a few years before Wolfenstein 3D to boot. 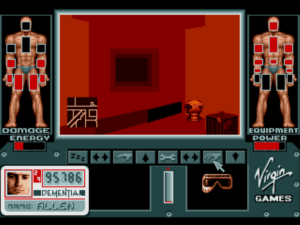 It was ambitious on an Amiga, and porting it to the Genesis, well, isn’t without problems. The Genesis’ specs are comparable to early Amigas, right down to the Motorola 68k CPU, so I imagine the port was fairly straightforward. To this end, the 3D engine runs reasonably well. You’re looking at about 10-15 FPS in a clear hallway, with some heavy (but manageable) draw-in at just a few feet away. Navigation is choppy, turning is even worse, but you can get through it if you’re really determined. Unfortunately, packs of nearby enemies slow things to less than a crawl – to the point that D-pad commands weren’t registering on the first or second push. The second level (or floor four in the game’s parlance) features closets that seem to spawn green mutants. Kill one, and more get generated. I had to skip this level by resorting to Internet passwords, because even three or four mutants in the next room was enough nearly freeze the game. Both you and the engine can handle one or two foes, but there are areas that turn the game mostly unplayable. Computer interfaces are fully mocked up. Always a nice touch. Slowdown aside, the deficiencies of such an early engine make just general navigation a bear. Everything looks the same. If you’re close enough to the walls that you can’t see the floor for reference, you can’t tell if you’re turning at all – it’s all a plain white screen, like being trapped under an avalanche. You carry a compass in your inventory, but that can’t tell you if you’ve been into a room before. The minimap, luckily, makes everything playable. It drains energy, but slowly, and can be switched on and off if needed. It does cost money however, so you may have to forgo some fancy armor for the ability to actually navigate the damn level. The interface is streamlined for the console, and mostly works well. Pressing Start drops you to a horizontal menu of commands, and you can only select buttons based on what’s contextually available. The left window shows what’s on the ground, the right window shows the current selection in your inventory. If you click the Use icon with something in your inventory, it will either consume the item, or restrict a second listing to items you can combine with the first – you’ll Use your gun, then the charging cable to reload, for example. It’s a bit cumbersome to flick left and right through your entire inventory to find what you need, but not unmanageable. There were some concessions made for the console, however. On computers, the keyboard ran your movement and the mouse pulled double duty with the interface and aiming. Without a mouse, the Genesis simply auto-aims at every target. The trouble here is that destructible scenery is also targeted, so your crosshairs will snap to the inert strobe light on the ceiling while ignoring the camera beside it threatening to raise an alarm. The paper doll indicator on the right of the interface is supposed to indicate equipment. 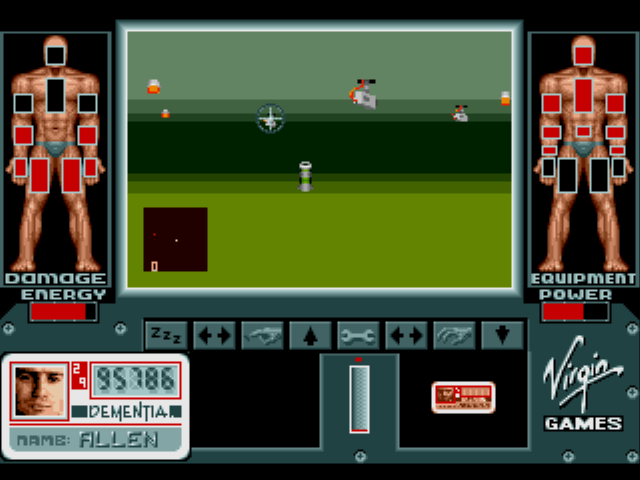 On the Amiga, you use the mouse to drag items to and from to equip them. You can’t do that here, so it doesn’t appear to have any use. Auto-aim lets you zap ceiling cameras. 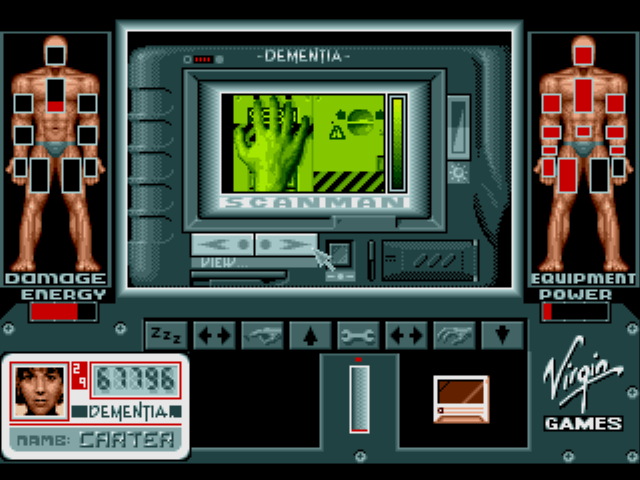 Items can also break on the Amiga version, requiring you to combine items to repair them. That seems to have been taken out in the Genesis. You can collect broken gear (indicated with a red X), but I wasn’t able to select the wrench icon to repair them. Not that it matters, as their chance to break appears to be randomly calculated… each time you come across the item. In every case, “repairing” was as simple as dropping the item and picking it back up. One final loss appears to be Psionic abilities. In the Amiga, humans can learn Psi attacks over time. Only the Genesis manual, which I wasn’t able to find online, would know for sure, but it seems to have been cut here. 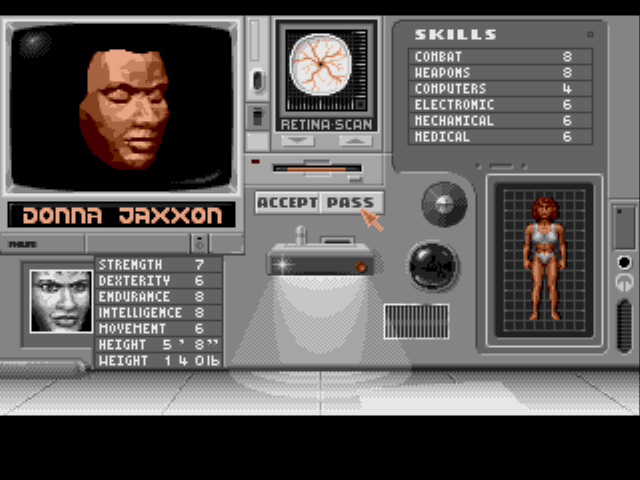 I could find no way to trigger such abilities, no icon to select them, and there is no Psionics rating on the initial character select screen (there is on the Amiga). Someone who muscled on further into the game might be able to confirm, but like I said, stuttering through the fourth floor was enough for me to throw in the towel. It’s a great, ambitious idea, and the original Amiga version beats even System Shock to the cyberpunk table. I look forward to revisiting the DOS port of this, but the Genesis version just can’t be recommended. Good on them for trying to bring a meaty RPG to the consoles, and it’s certainly a unique experience in the Genesis library, but the power just isn’t there when the enemies show up in force. If you really want a console FPS, Zero Tolerance expertly shows how it’s done. Smart ideas based on pen and paper cyberpunk games, and one of the first titles to bring those ideas to video games. Early 3D engine won’t win any beauty contests, but is mostly functional. Plenty to explore. Choppy navigation doesn’t make exploring much fun, and more than a few enemies brings the game to its knees. Interface was originally designed for a mouse, and the console rethink isn’t as quick and efficient. Only one piece of music that plays throughout the entire game; luckily you can turn it off. Well, this is an interesting review! I own a Corporation original for the Amiga. 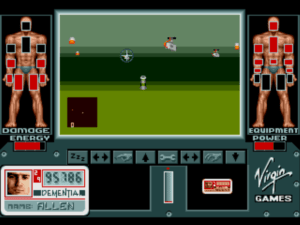 The gameplay is quite slow there, too, both on the technical side (frames per second) and as far as the action (frequency of encoutering enemies) goes. As you noted, this was before Wolfenstein 3D and Doom changed the emerging genre into a pure rapid fire affair. I do wonder why they seem to have left so many things out of this port, though. The Amiga version comes on just two DD floppy disks, i.e. it’s about 2MB – surely that can’t be a capacity problem on the Mega Drive? It’s funny, because virtually all I can remember about this game on the Atari ST was the slow movement and poor frame rate. I really liked the concept, but never made any progress. If psionics really was removed, my guess is it would be for complexity. There’s no room on the interface for a “selected power” indicator, and there’s so much going on here anyway that it seems unnecessary. I will definitely play the DOS version at some point. Based on videos, it seems to run the fastest. And like I said – with the exception of packs of enemies – you can suffer through the framerate if you really want to. But I’m interested in seeing how the game feels when you don’t have to suffer. As would I, sir. As would I.
hey I loved this game as a kid but level 2 with the green mutants was too tricky. Seem to remember the psionics were hidden like an easter egg you had to discover. They were accessed by clicking on one of the paper dolls faces (probably the damage status one).